Item is a photograph of a grist mill, located in Drummondville, and surrounding landscape. The grist mill was erected in 1837 and was rumored to have been haunted. Item is a photograph of the Canadian Fairbanks Co., located in Sherbrooke, which made valves and scales for the railway. Item is a photograph of Walter Blue and Co., once the largest clothing manufacturer in the Eastern Townships. Item is a photograph of the old Paton Mill located in Sherbrooke, which produced woolens. 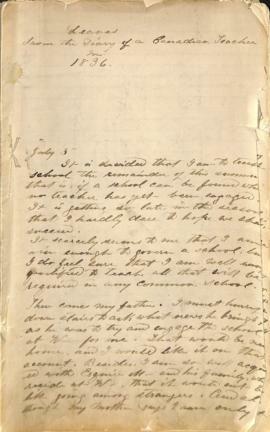 It has since closed and been partly removed from the site. Item is a photograph of the W.R. Webster & Co. Cigar Manufacturers' building. Item is a photograph of the George Long Manufacturing Co. that made cabinets, with two horses standing in front. 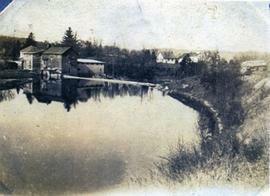 Item is a photograph of the Magog River near the wooden mills and surrounding landscape, taken near Sherbrooke. Item is a photograph of the Magog River taken from the St. Francis River, with the Banner Sewing Machine Co. visible on the shore. Item is a photograph of a grist mill located near Denison's Mills. Item is a photograph of a cotton mill located in Magog. Boston Last Coy's Factory, Richmond, Que. Item is a photograph of a postcard of the Boston Shoe Last Company, maker of models for shaping or repairing shoes or boots, located in Richmond, around 1920. Item is a photograph of the Paton Manufacturing Company located on Courcelette Street in Sherbrooke. Item is a photograph of Wells Marble and Granite Works, with tombstones visible in front.